If You Missed Bib Pickup, You Can Get Your Bib Sunday Morning at 6:00am-7:00am at the Start Line. Please Arrive Early. The San Jose Shamrock 5k & 10k Run/Walk & Leprechaun Kids Run benefiting the San Jose/Dublin Sister City Scholarship Program is the newest Represent Running event. The 10k & 5k run/walk starts and finishes at San Pedro Square in downtown San Jose. After finishing at San Pedro Square, enjoy the post-race celebration with live music, beverages, watch the adorable Leprechaun Kids Run, and grab brunch with family and friends. Participate in each event individually. Combine the three Silicon Valley-based events into the Valley Challenge. Combine the three Bay Area-wide area code events into Run the Bay Challenge. Crush all five and earn the Series Star medal, on top of the Valley & Run the Bay Challenge medals. 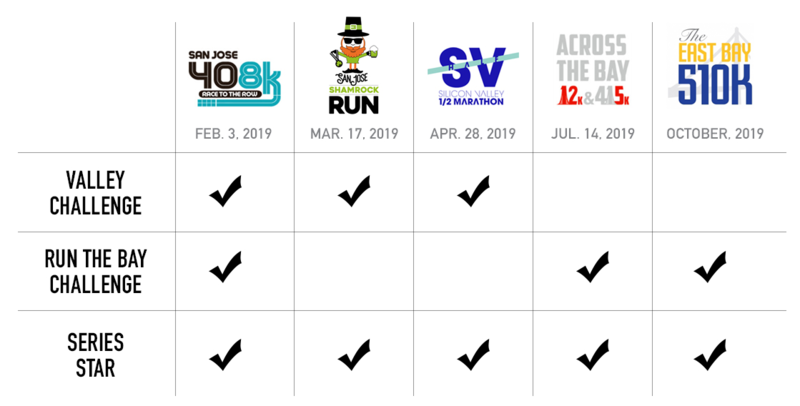 Represent Running Series Star – choose all five! The 10k starts and finishes as San Pedro Square in downtown San Jose. Did you miss coming out race day but still want to participate in the San Jose Shamrock Run? You can run remotely on your own and we'll mail out your race shirt, medal and race bib. This also qualifies you for the Valley Challenge Medal and Represent Running Series Star. The 5k starts and finishes at San Pedro Square in downtown San Jose. 10k & 5k Run/Walk Price Includes: Official Race Tech Shirt, Finisher Medal, Virtual Goodie Bag, and access to the festival after the race. Remote Runners Price Includes: Official Race Tech Shirt, and Finisher Medal sent to you the week after the race. Remote running qualifies you for the Valley Challenge Medal, and Represent Running Series Star as well. Leprechaun Kids Run Price Includes: Official Race Cotton T-Shirt, Kids Race Medal, and an early love for physical fitness.